DK Students are encouraged to attend conferences and schools, and to make scientific visits. Doing so, you are typically expected to pre-finance your trip and to claim reimbursement afterwards. On this page, we provide instructions for the students at TU Graz. Similar rules should apply for the students at KFU Graz and MU Leoben (please consult your advisors or experienced colleagues). The reimbursement of travel expenses can be obtained from many different sources, including the Doctoral School for Mathematics and Scientific Computing and the DK Discrete Mathematics. The office for International Relations is another source for both staff (see here) and students (see KUWI and Erasmus+) that you can take into account. Make sure that you double-check with your advisor and ask for an appropriate way of funding your next journey. Finally, if it's possible to get financial support from the conference you're attending, you should apply for it. If you fill in all forms correctly and add all necessary documents, then it does not take long until you are reimbursed with your monthly salary (up to two months). You have to fill in one form before the trip and another form after the trip. Please find below a tree that directs you to the forms. You may click on its leaves to download them. Now we explain all steps you need to take. Note that, in case you do not want to claim reimbursement from TU Graz, say because you are invited, you should book your leave via the Personal Self Services (PSS) at TUGRAZonline instead of filling in the two forms. Moreover, if you plan to travel for more than one month, you should apply for Freistellung instead of filling in the first form and just fill in the second form after coming back. In case you don't know how this works, please ask us or your experienced colleagues. "OU Number" / "OE-Nummer" refers to the number of your organizational unit, e.g. 5010 for Math A. Unless you apply for pre-financing (see below), you may leave the two fields "estimated total costs" / "geschätzte Gesamtkosten" and "order number" / "Innenauftragsnummer" void. However, we would highly appreciate if you gave us at least an idea of the costs. To ask the head of your department to sign it. To give or send the form to the DK coordinator Mario Weitzer or directly to Wolfgang Woess, who has to approve your request for the business trip. Travel expenses such as flights, accomodation, and conference fees may be also pre-financed. In this case fill in the field "Travel costs advance payment" / "Reisekostenvorschuss". For pre-financing of travel expenses no invoices are required. The "order number" / "Innenauftragsnummer" of the DK, which you are required to fill in on the second form, is E-1505W01230. 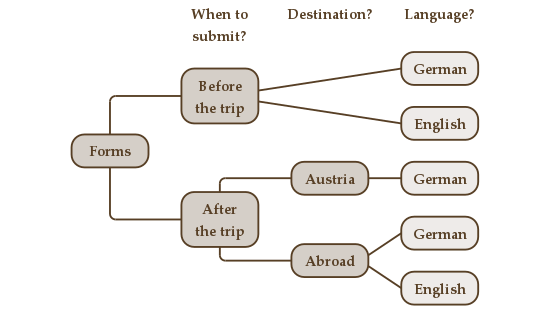 You have to fill in the exact departure time from and the exact arrival time to your home in Graz. The time of the border crossing is also needed, for journeys abroad. If you're bringing bills from a country that uses currency other than Euro, you should print out historic exchange rates for the days when you purchased a ticket or paid a hotel, etc. You can do that for instance here. Collect all your original tickets, boarding passes, and original receipts, otherwise we cannot reimburse you. Please glue them on white sheets of paper, do not staple them. If you have paid by credit card and your payment is not mentioned on the bill, please add a copy of the monthly credit card statement. You may, of course, hide the irrelevant items on the statement. You should also add an invitation letter or a confirmation of participation to the conference or school, if possible. To sign it yourself twice, one time confirming the correctness of the data and another time as "Applicant" / "Rechnungsleger". To give or send the documents to the DK coordinator Mario Weitzer. Depending on the office software you are using, the above forms may have annoying pagebreaks when printed. If this is the case, we recommend to rescale the pages manually. The forms have been last updated on December 1st, 2015. Their most recent versions can be found on the TU4U system. After logging in, you just click on "Meine Reise als Mitarbeiter/in" → "Dienstreise" → "Formulare".